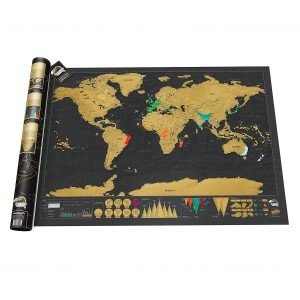 This deluxe edition of the Scratch Map celebrates your world travels with flair. Simply scratch off the metallic foil from the places you’ve visited to reveal a bright pop of color underneath. This edition features topographical markings, showing the mountain ranges and oceanic ridges that add variety to our world. It also has a row of infographics along its lower edge with interesting facts about world geography. Makes a fun, decorative piece for world travelers, armchair travelers, or students who are exploring the world through their studies.